While the broader market does seem to be pivoting towards OLED display going forward, it’s still probably going to be a while before the next-gen display tech finds its way into the sub-$2000 market. In the meantime, the TCL X2 makes for a stellar alternative. Like OLED, QLED is one of those next-generation display technologies that - so far - has belonged pretty exclusively within the premium segment of the TV market. Even if the long-term future of QLED doesn’t look quite as bright as OLED - there are some pretty practical reasons why companies like Samsung have stuck to the former. Just last year, Samsung’s QLED range landed at the top of the top of the premium market with some of the more-expensive models in the Q7, Q8 and Q9 ranges costing close to ten grand Now, just twelve months later, TCL is landing with their own QLED offering at the much-more affordable starting price-point of $1999. Sure, QLED might just be a souped-up version of existing LCD LED display tech but the results you can get out of it are very much comparable to OLED - not to mention compelling. What’s more, if things like the TCL X2 is any indication, the price on QLED looks primed to fall far quicker than that of OLED. 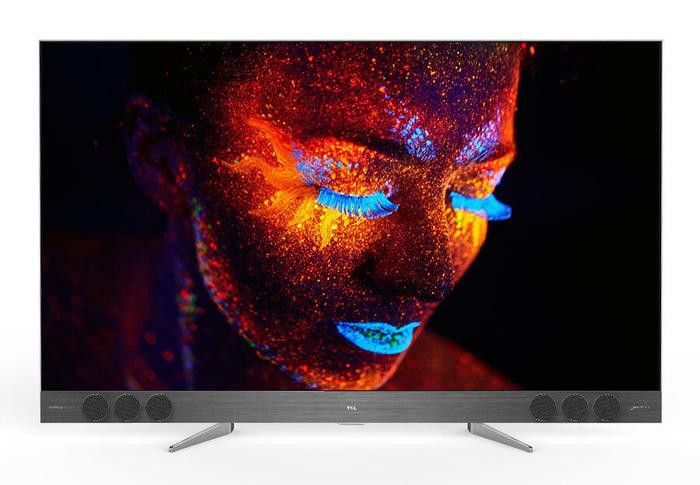 The TCL X2 QLED TV is the company’s new flagship LCD QLED smart TV. 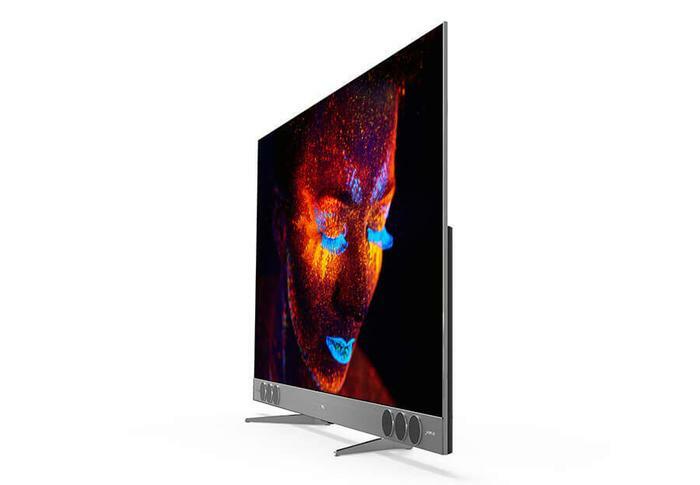 It’s available in 55-inch and 65-inch sizes, runs on Android TV and boasts both a 4000:1 contrast ratio and Harman Kardon tuned sound audio. With a 3842x2160 pixel resolution, the X2 supports UHD/4K content and HDR10 content, courtesy of the wider color gamut afforded by QLED. Portwise, the X2 comes packing 3 HDMI inputs (1x ARC + 1x MHL), 2 USB inputs (1x USB 2.0 and 1x USB 3.0), an AV-In and a set of optical and 3.5mm audio outs. The TV also comes with a 3-year warranty. In terms of design, the X2 feels like a hybrid. It’s got a foot in either corner, with the upper half of the unit touting a super-slim silver frame. In a sharp contrast, the bottom half hangs out and sits a little closer to the chunky LCD of old. Still, it’s not too chubby - and that chubbiness does serve a purpose. It’s here that all the ports reside, neatly concealed underneath a removable plastic panel. Depending on your home theater set up, this may make the X2 an easy option when it comes to getting that complex home theater setup without the sight of wires everywhere but, again, it is very much going to depend on your setup. Personally, I did find myself wishing for a few more HDMI ports. Your mileage may vary. If I had to sum up the aesthetic of the X2: it’s that it does a very good job of looking like a premium-end product. From the moment you see it, you get the sense that a lot of the design decisions have been in an attempt to cut down on the bezels as much as possible. Upon closer inspection, this polish doesn’t always hold up but, at first glance, it casts a fearsome silhouette. 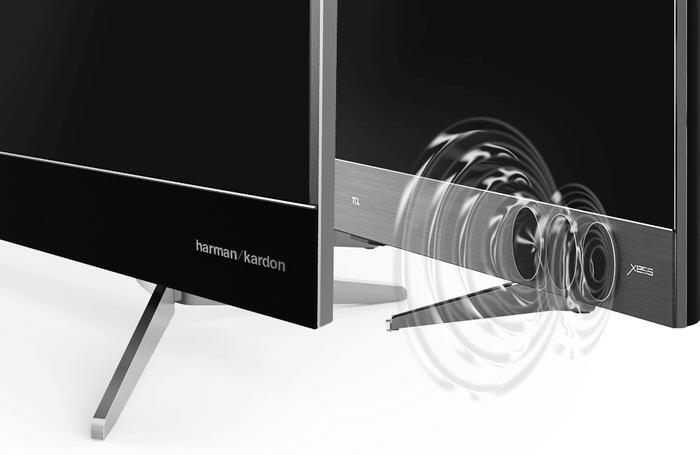 What’s more, this premium visage comes accompanied by a set of Harmon Kardon tuned speakers integrated into a bumper at the bottom of the unit. Acting as an integrated soundbar, they make for a solid, literal underline the display. They also sound quite good. “Obviously”, this don’t sound as good as a dedicated sound system or soundbar would. However, having spent a lot of time testing sub-$2000 TVs in the past I can safely say that they sounded a significant step above what you’ll usually get when it comes to integrated sound. The final aspect of the design worth touching on here is the integration of Android TV. Even compared to much-improved offerings like LG’s WebOS and Samsung’s Tizen-based solution, Android TV still holds up as my personal favorite smart TV interface. It’s simple, it’s clean and ubiquitous enough that it works with pretty much everything. Overall, it brings a ton of pros to the table and not a whole lot of cons - aside from a slightly padded boot-time. 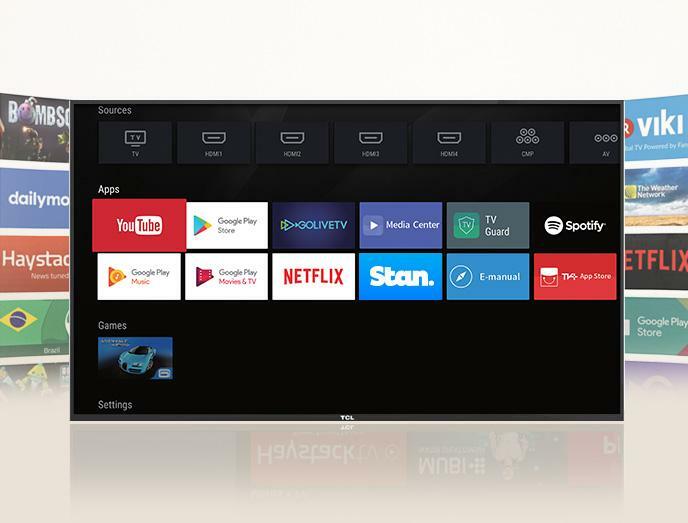 Courtesy of these Google-powered brains, the TCL X2 touts an integrated Chromecast, a robust UI and frequently-updated software lineup as well as support for Google Voice control (though not quite Google Assistant) via the remote control. Speaking of those remotes, the X2 actually comes with two. One longer, more complex one that includes all the usual suspects - and a small bite-sized one that cuts things down to the bare essentials. Both boast a dedicated Netflix button and while there might be a small learning curve to the Android TV interface for some, the overall added value you get from being able to unify your various streaming services is well worth it. In terms of the picture quality, we were absolutely not disappointed by the TCL X2. It’s a 4K TV - images look appropriately gorgeous - and one boosted by QLED - which means those ultra-detailed images are backed up by a vibrant 800 nits of brightness. It doesn’t quite have the crisp sheen of the Samsung’s QLED displays but it definitely feels like it sits well within in the same ballpark at a fraction of the price. HDR support isn’t as rare of an inclusion in the sub-$2000 TV market as it was a few years ago. However, it’s a welcome one here. TCL have branded the X2 as ‘HDR Pro’ ready but all this really constitutes is that it supported HDR10. There’s no support for Dolby Vision or HLG to be found. Still, testing out the capabilities of the X2 proved a delight. The lush cinematography of Planet Earth 2 felt like it was positively leaning off the screen at times. The X2’s QLED display ensured colors contrasted with more ‘oomph’ while the 4K pixel-count meant that images looked sharp enough that you could cut almost yourself on them. We also spent some time with the recent Ultra HD version of Kong: Skull Island. Here, colors carried through with additional depth and brightness while the Harmon Kardon-tuned sound brought some added bombast to the film’s already thumping score. The X2 also proved itself a great display for 4K gaming using the Xbox One X. Games like Star Wars Battlefront II, Assassins Creed: Origins and Destiny looked incredibly smooth and detailed. At times, and particularly during space battles, sequences from the former actually looked almost indistinguishable from the films it strives to emulate. Even when you’re not watching 4K content, the upscaling on the TV does a reasonable job of keeping things sharp - although the overwhelming brightness afforded to the display via QLED gives everything a glow that isn’t always welcome. It can make darker scenes, like those in Marvel’s The Punisher, more visible but it can also occasionally make lighter ones look a little overexposed. Overall, I wouldn’t necessarily say it was the most impressive execution of HDR I’ve experienced. That said, it’s definitely the most affordable. If I had to pick between the X2 and Samsung’s premium-grade QLED, the latter would almost certainly come away the winner. However, the difference in quality is subtle and nowhere near what the gulf between the two price-tags would suggest. For most, this will serve up a perfectly excellent home theater experience. The TCL X2 might not be the best value TV you can find under $2000. However, it’s probably the only one you can find in that price point that boasts a QLED display. Throw in the robust Android TV integration and Harmon Kardon tuned audio setup and you’ve got a great all-round package that’s easy to recommend even at a price point double what TCL are selling it at. While the broader market does seem to be pivoting towards OLED display going forward, it’s still probably going to be a while before the next-gen display tech finds its way into the sub-$2000 market. In the meantime, this makes for a stellar alternative.